This report aired Sept. 11, 2013 on Prairie Public. It’s part three of a four-part series on injuries and deaths in North Dakota’s oil patch. Todd Melby was the reporter. I’m at a pizza place in Laurel, a small town just west of Billings. Lacey Breding is at a booth with her daughter and a friend. Outside, the sun is mercilessly hot so everyone is wearing shorts. “Whatcha doing, monkey?” says Lacey Breding. That’s Lacey. She’s watching McKinley, her toddler, fuss with the salt and pepper shakers. For about a year, Lacey dated a man who worked in North Dakota’s oil fields. They met at a rodeo. She was just there because she had nothing else to do. And then she saw a cute guy with unruly brown hair tucked under his cowboy hat. “I knew his friends, but I’d never had seen him before,” Breding says. Lacey and Dustin, who were both just a couple years out of high school, made plans to spend the rest of their lives together. Dustin landed an oil field job that paid about $60,000 a year. They planned to marry. They planned to buy a house. They planned to open a business together. Then on one cold January night last year, Dustin reported for work as a well watcher, He worked alone, monitoring fluid levels on giant tanks near Mandaree. He spent most of his time in a trailer. But every two hours, he climbed a ladder, walked across a catwalk and opened the hatches on multiple storage tanks containing oil, frac water and gases. Sometime around midnight, a co-worker called Dustin. When he didn’t respond, the worker drove to the site and found his lifeless body on a catwalk. Says her friend Jason Bold, “She might sound like a broken record, but that’s her favorite record.” He’s wearing a tan cowboy hat and eating cheese sticks. He and his girlfriend used to hang out with Lacey and Dustin. After Dustin died, Jason was so upset to see Lacey alone with her daughter that he organized the Dustin Bergsing Memorial Bull Ride. The event was held at Miller’s Horse Palace near Laurel. “We had damn near 300 people show up at the horse palace, which is the largest, biggest event the horse palace ever had,: Bold says. After Dustin died, his mother sued Marathon Oil. They own the well where Dustin died. The case was settled out of court for an undisclosed sum of money. 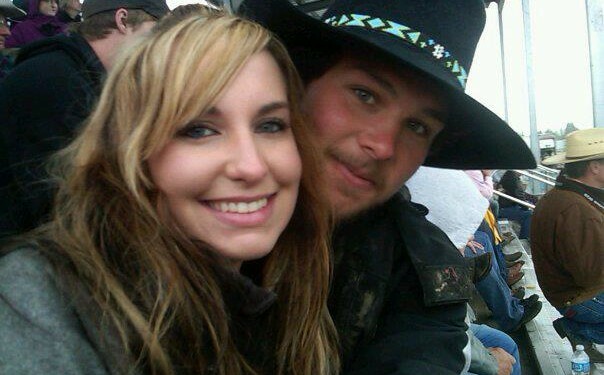 As is typical in cases like these, Dustin’s mother and his fiancée, Lacey Breding, can’t discuss the details. So they go on living. Lacey carries around a soft cover photo album for McKinley. Inside are photos of a father McKinley will never see again. God bless and watch over this woman and her baby and all the rest of us oilfield widows. My husband was killed in the patch 3 years ago. Could have been avoided. Love and prayers.